There are a lot of videos, movies, TV shows, music videos, etc available on YouTube, most of which are delivered in a format of MP4. But chances are most YouTubers need to extract the audio from a YouTube video only for listening, editing, making playlist or adding up to their music library. No surprising many users asking for a solution to converting YouTube to MP3. Here in the article, you will find the most reliable solution and a trustworthy YouTube audio converter to conduct the conversion from YouTube MP4 to MP3 with no quality loss. Extract audio from YouTube MP4 video to be saved in MP3 and other audio formats like FLAC, AAC, WAV, M4A (iPhone Ringtone) etc, and deliver high quality. Directly download YouTube video to iPhone iPad Android 3x faster than others. Small file size: MP3 has high compression ratio. Consequently, the file size is small, about 1/10 the file size of data CDs, but the sound effect is great. Besides, small MP3 file size makes it great to copy, deliver, share online and store on mobiles. 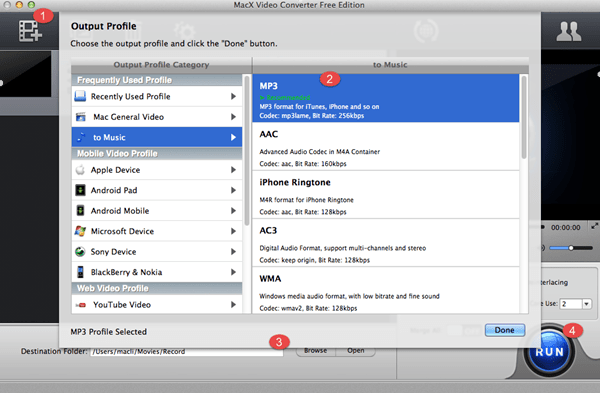 Wide compatibility: MP3 is the audio standard, which is playable on devices, media players such as Windows Media Player, QuickTime, 5Kplayer, VLC, etc. ID3 taps: MP3 features ID3 tags to store the artiest name, song title, year and genre. Therefore, you can create your own playlists by converting YouTube MP4 to MP3. It's true that Clipconverter is a 100% free YouTube online conversion program competent to rip MP3 music from YouTube MP4 video with purely 4 clicks needed and nary a third party or plug-in downloaded. But when your network speed is a tad slow and you apply it to separate MP3 from YouTube MP4 online, then you have to patiently wait a long time to anticipate this job done. 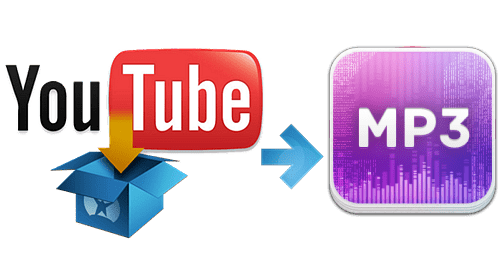 Worse still, this online YouTube MP4 to MP3 music conversion app only allows you to convert MP4 YouTube to MP3, ACC, M4A, 3GP, AVI, MOV file formats. Thus, in case you want to transcode YouTube video to MP4, MKV, FLV, WMV, AC3, iPhone ringtone, etc, you have to turn your attention to somewhere else. 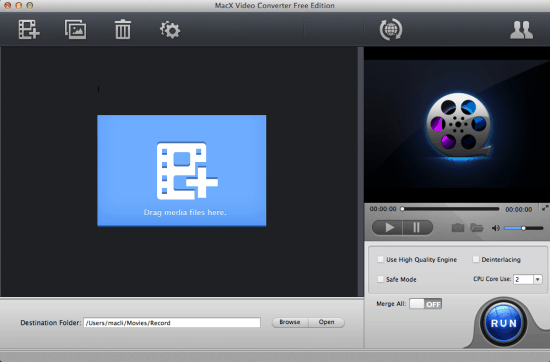 Fortunately, a leading provider of Mac software products MacXDVD brings a silver lining to the Mac users. It develops the world-renowned MacX Video Converter Free for Mac users to free extract MP3 audio from YouTube MP4 as well as generate ACC, AC3, iPhone Ringtone, MOV, AVI, FLV, MKV, etc. with 14 audio and over 180 video formats. On top of that, this software also overshadows its competitors in its unparalleled knack to handle YouTube MP4 (HD, 4K) video to MP3 task within seconds and zero quality compromising due to its multi-core CPU (up to 8) utility and High Quality Engine. How to Convert MP4 YouTube Video to MP3 Audio? Follow Me! Free download and run this free YouTube MP4 to MP3 converter on Mac and import source video by clicking "Add File" button. It accepts all the video/audio files downloaded from YouTube, including FLV, MP4, WebM, 3GP, HD YouTube (in 720P, 1080P, 4K). In the output format area, click "to Music" tab and choose MP3 as the output format if you need to extract MP3 audio from YouTube MP4 video. Click "RUN" button to start the audio MP3 extraction from MP4 YouTube on Mac. You can view the conversion progress and are able to cancel the converting process at anytime. For those who need to download YouTube video to Mac or PC, the advanced version MacX Video Converter Pro is out of this world. Aside from online YouTube video downloading, this cover-all program is also capable of converting almost any YouTube to MP4, MOV, MKV, etc for iPhone Xs Max/Xs/X/8/7/6s/6/Plus, iPad mini retina/Air, Galaxy S9, Huawei, Sony, etc. with 420+ preset profiles infused.